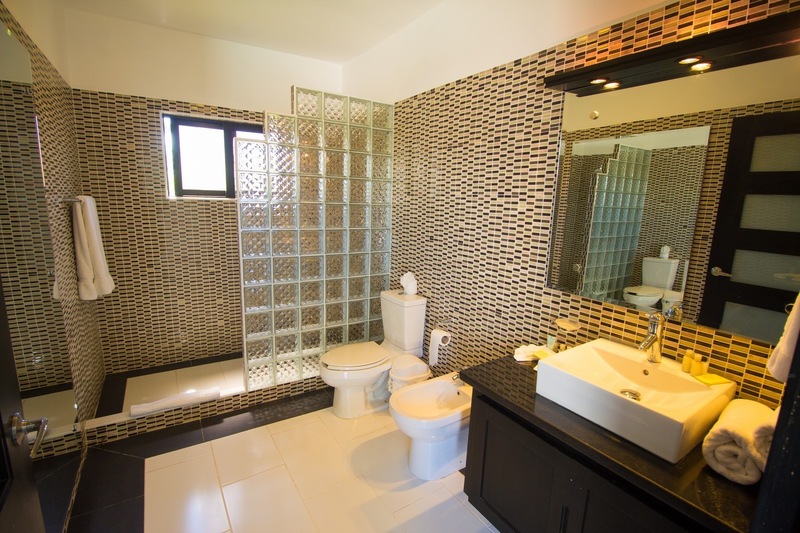 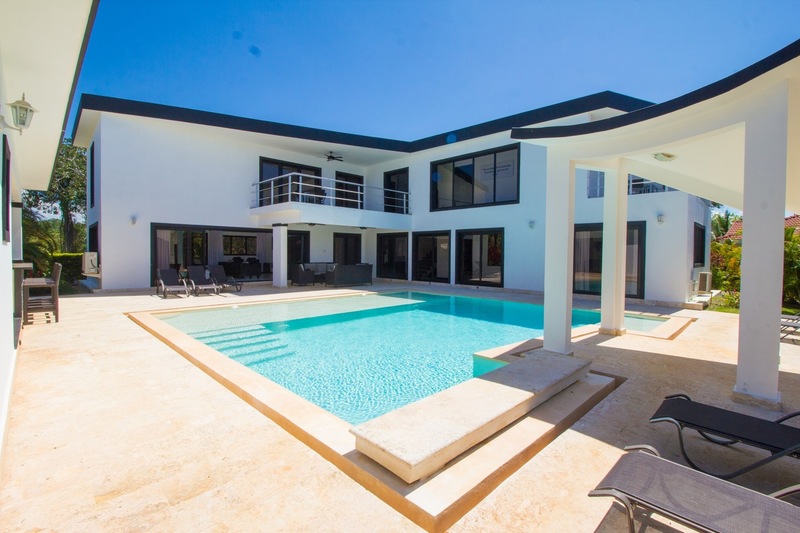 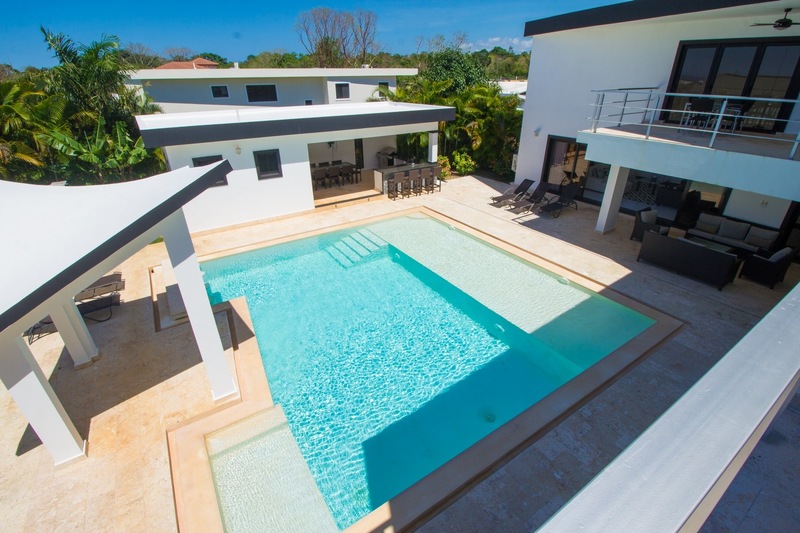 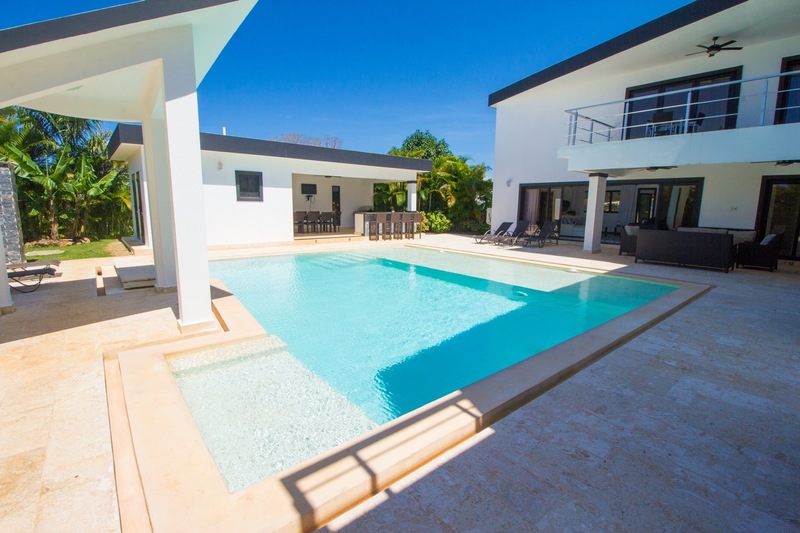 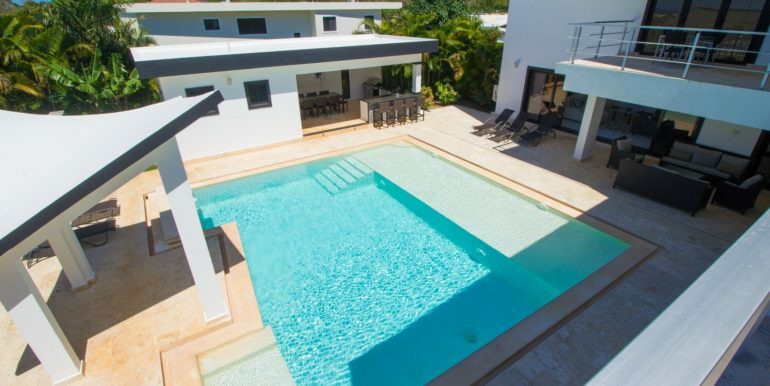 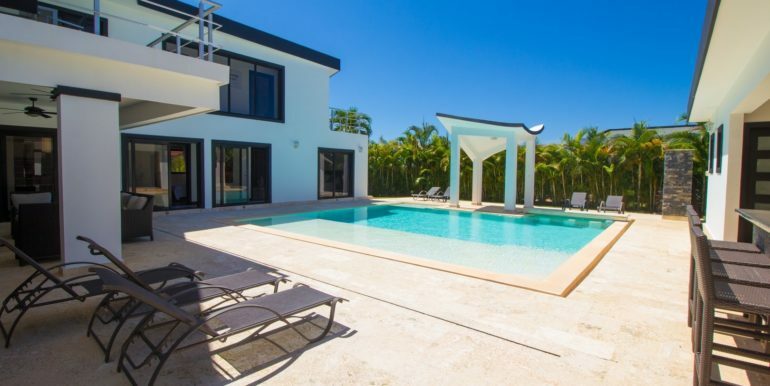 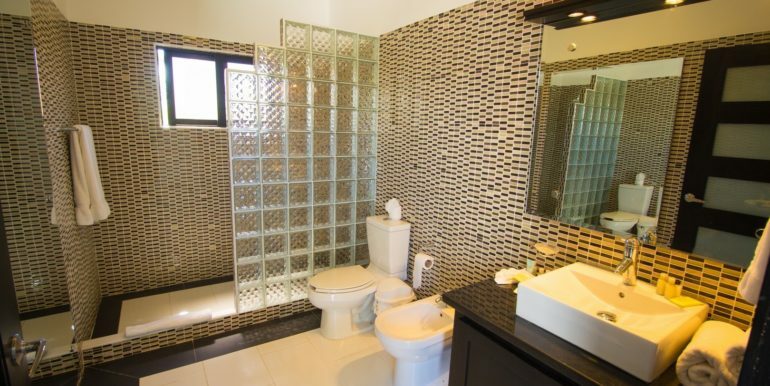 This 4 bedroom contemporary villa rental in Sosua is a class of its own. 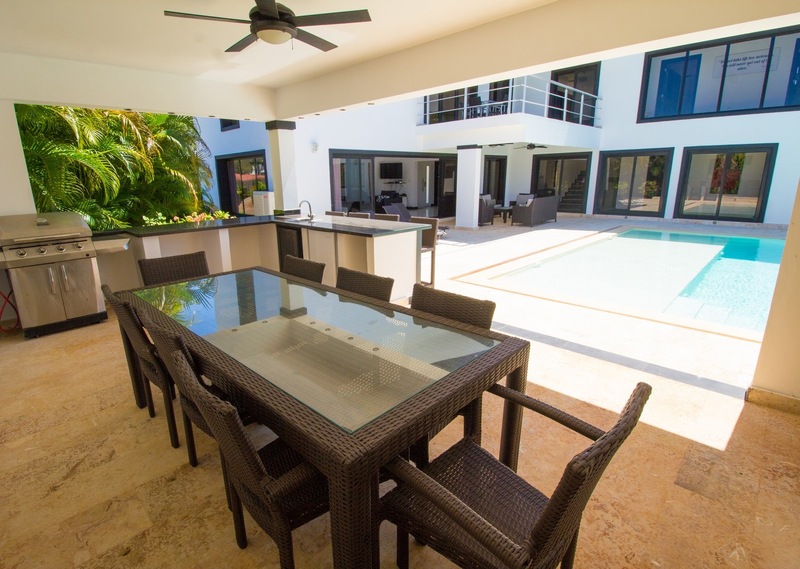 Custom built with 2 floors with spacious interior areas that provide true comfort for 4 couples. 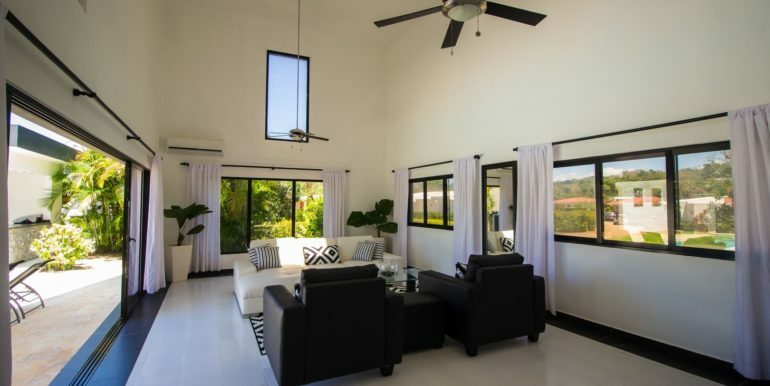 The first level has the living room, with very tall ceilings, and a panoramic sense through the glass doors and windows. 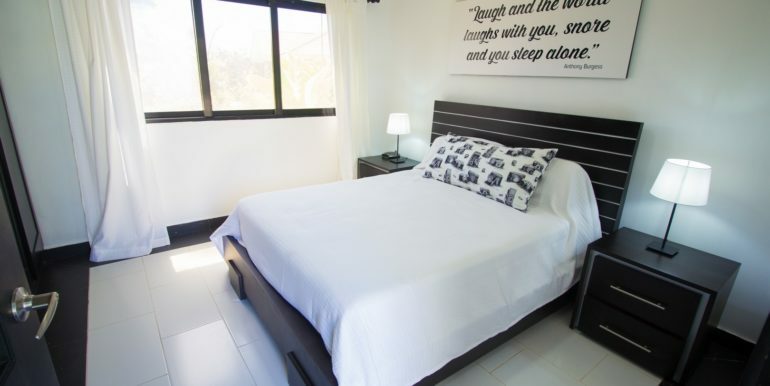 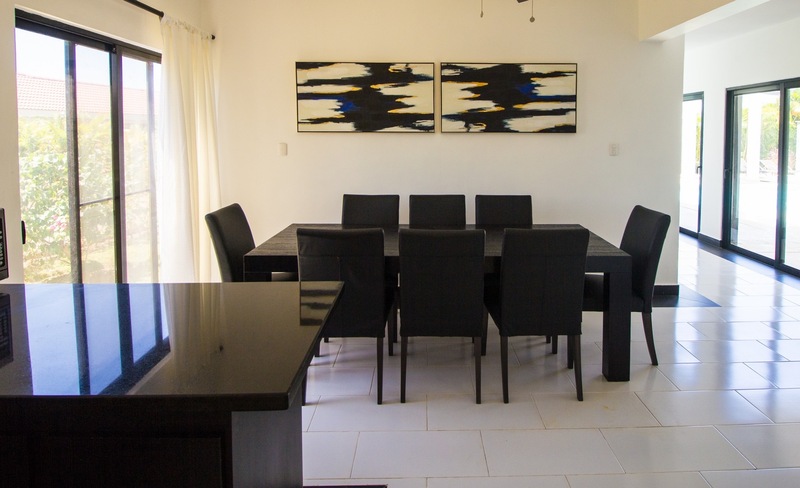 The villa decor is also unique in Sosua, perhaps because it focuses on a modernist minimalism that follows black and white as the main visual resource. 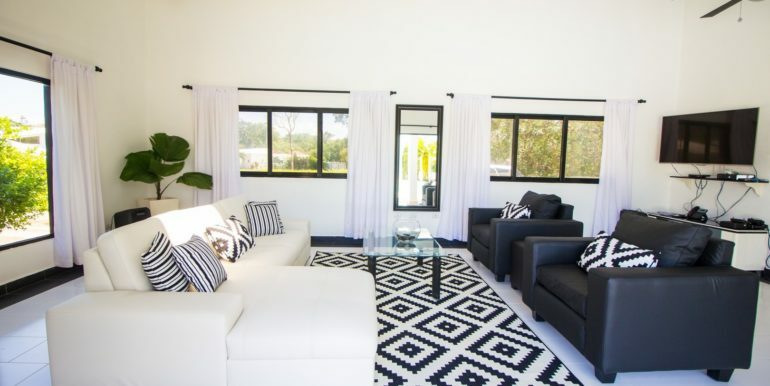 Opposing sofas ( black and white ) again brings to mind the Ying/Yang philosophy of interconnectedness. 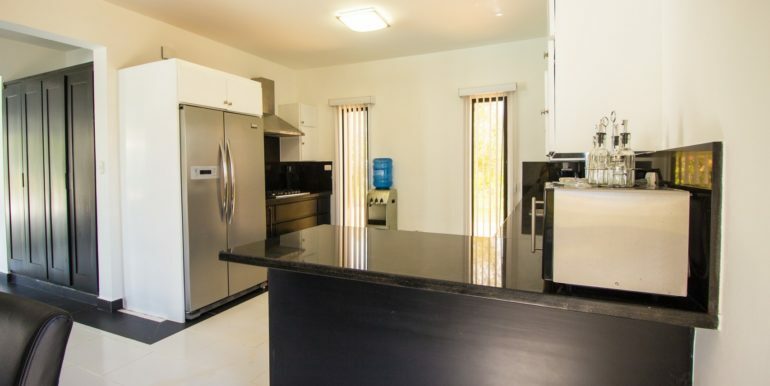 The kitchen has black cabinets, tops and stainless steel appliances, very futuristic. 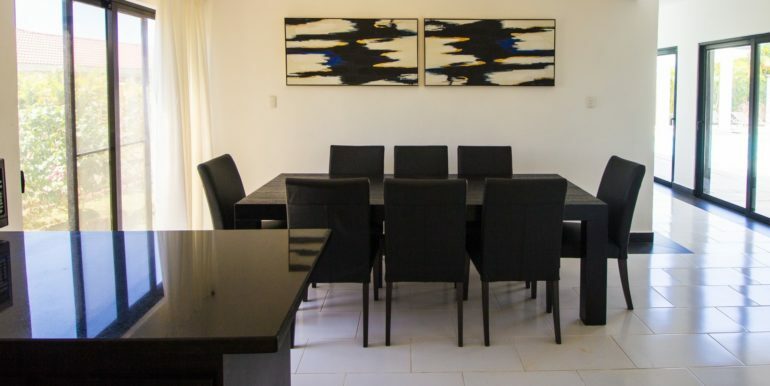 The dining area has a black table with black chairs, a stark contrast with the room`s white walls. 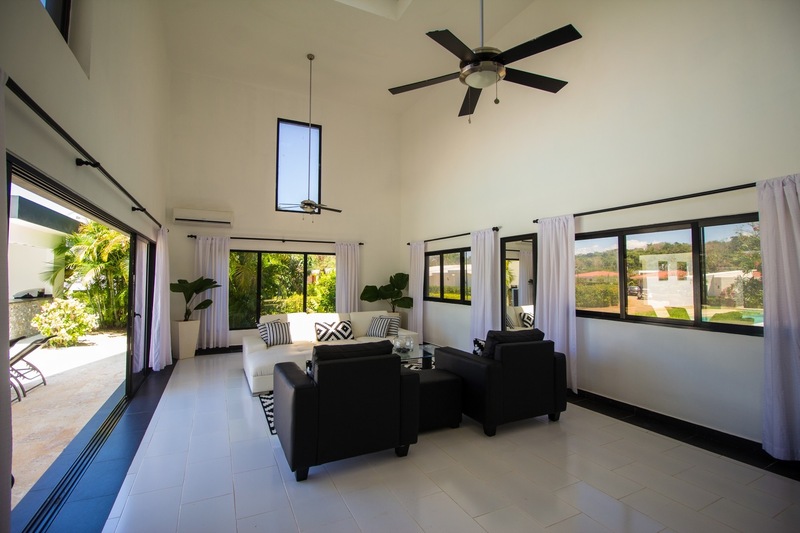 White ceramic flooring bring a heightened sense of balance to the overall decor. 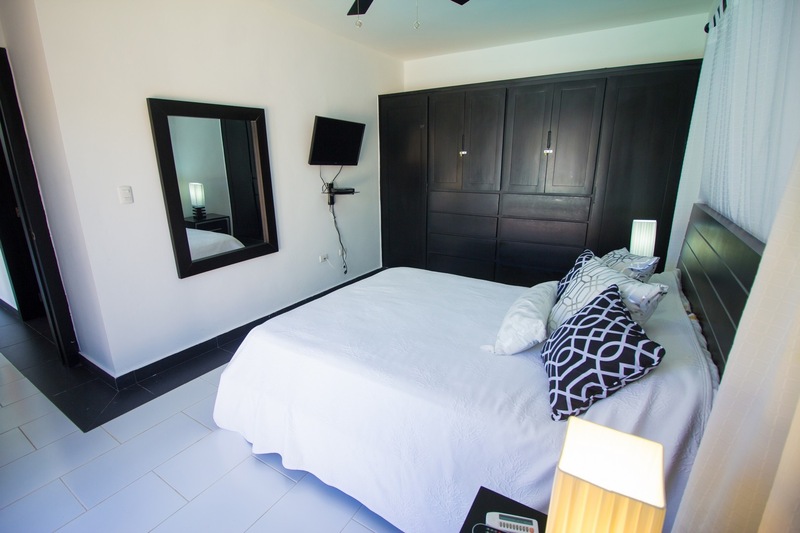 Past the hallway, the bedrooms follow the same bicolor trend; black cabinets and window frames, bed sets and white curtains and linens. 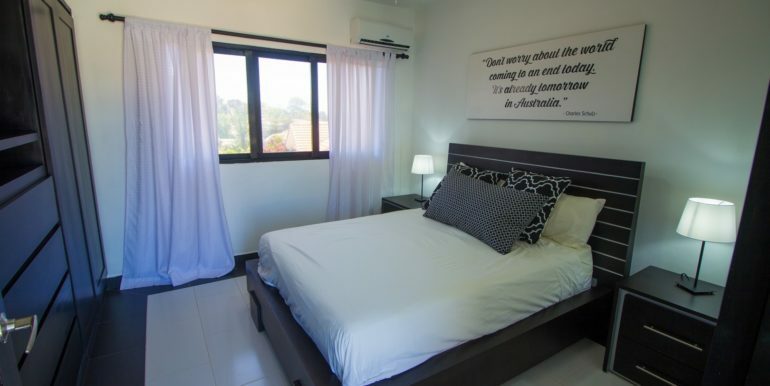 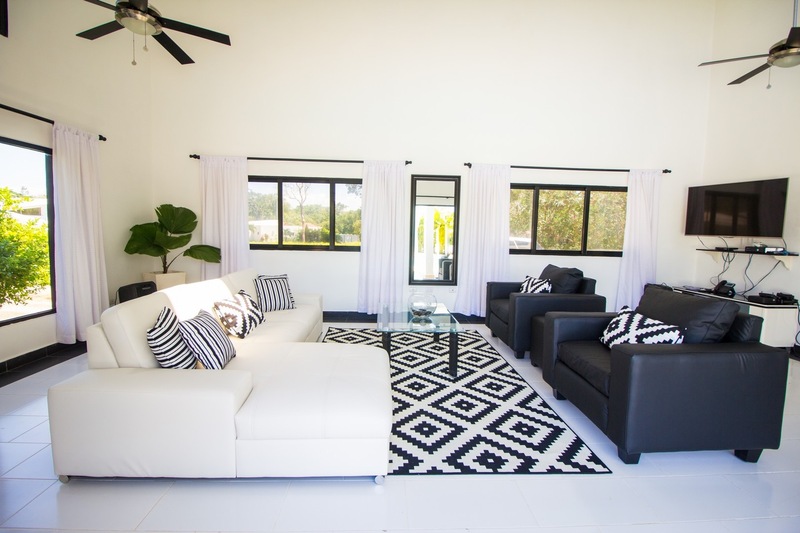 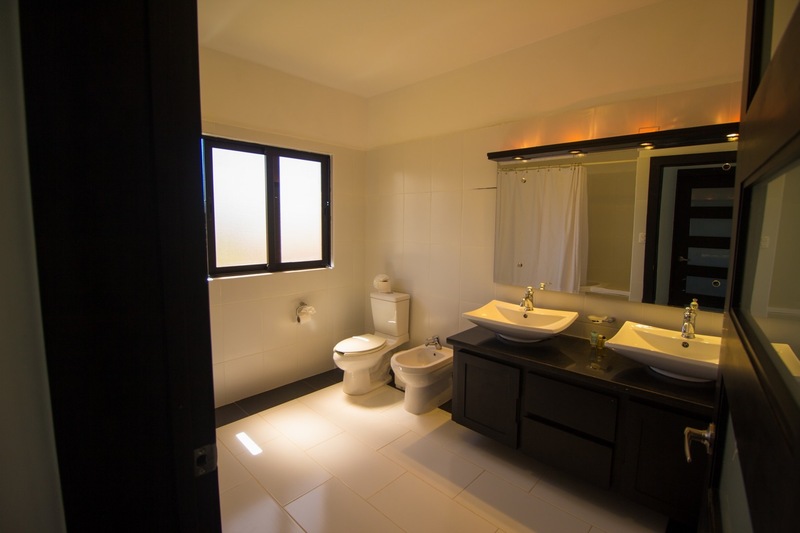 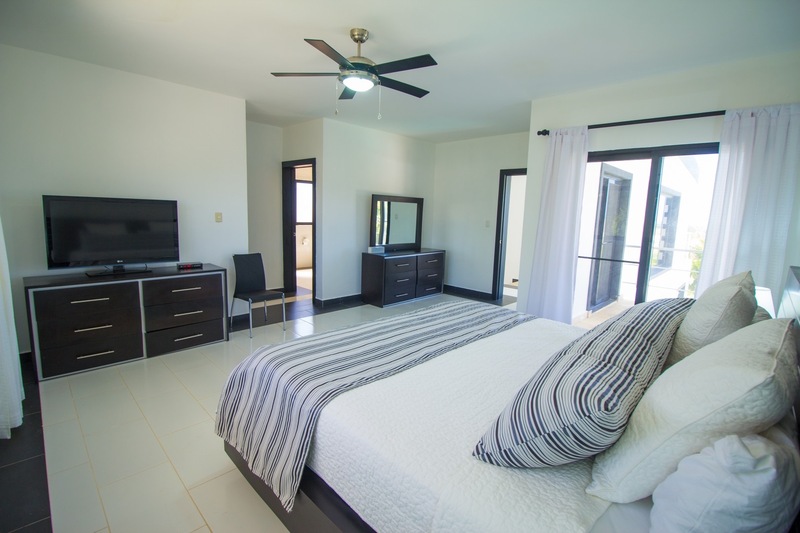 The villa is fully equipped, therefore each room has air conditioning, ceiling fans, beside tables with lamps, linens, towels and toiletries. 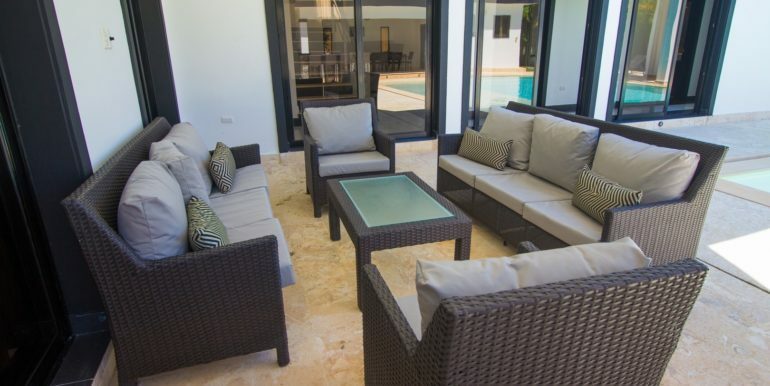 WiFi, backup power, cable TV and 24hrs security are included features ( see rental terms attached for specifics ). 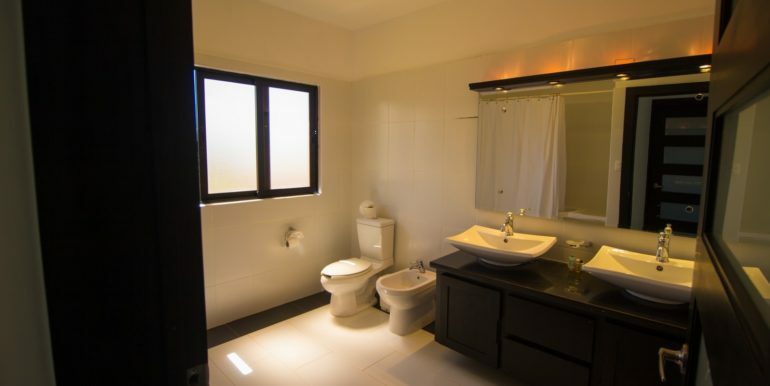 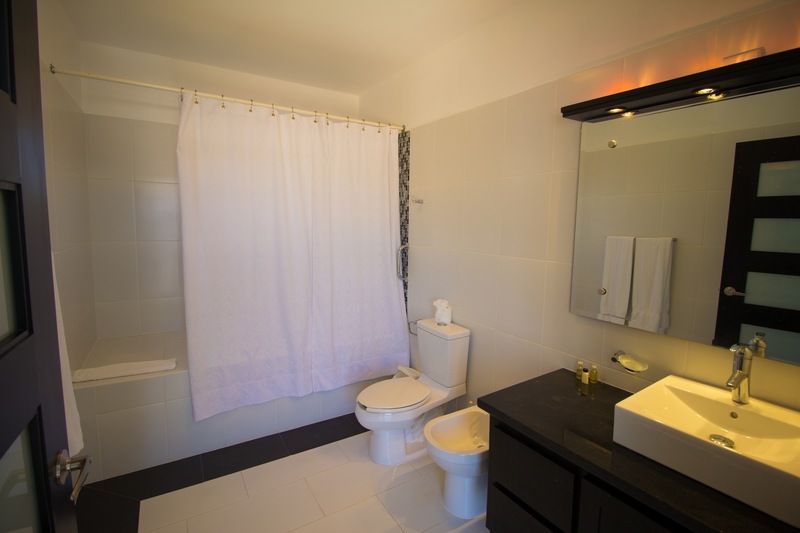 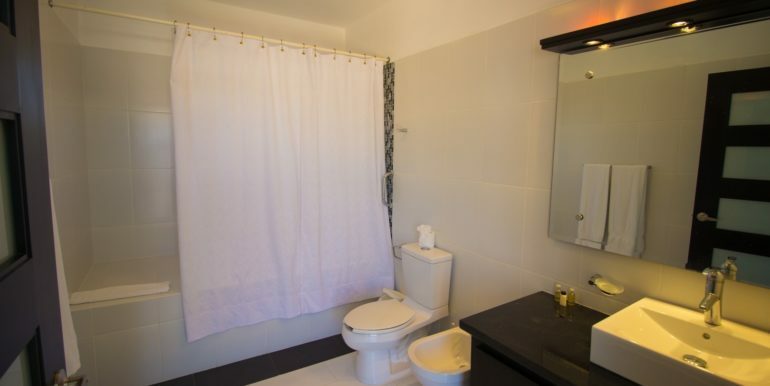 Each bedroom has a bathroom, of unique design featuring high end finish. 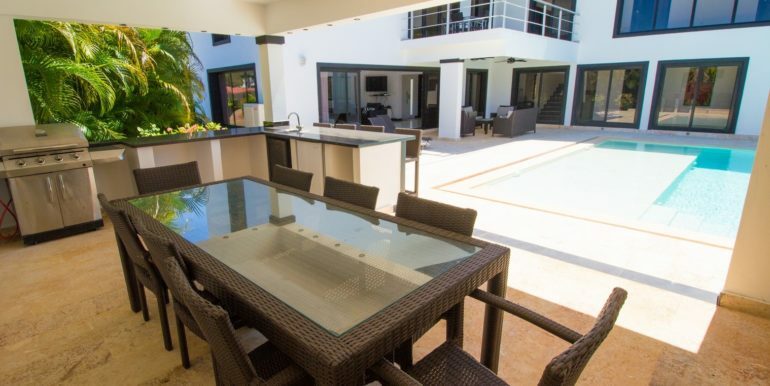 Outside, the ultra sized deck in native coral stone wraps around the magnificent swimming pool with border ledge for tanning, a shallow end where guests can chill with their mojitos all day while the chef prepares their favorite meal ( there`s an option to add a Sosua private chef to the rental ). 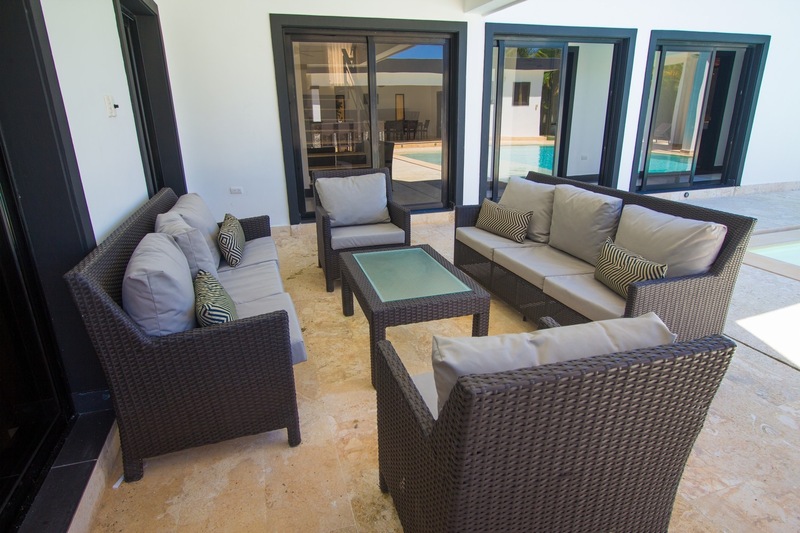 Under the veranda, there is a covered terrace with patio furniture to also enjoy under the shade. 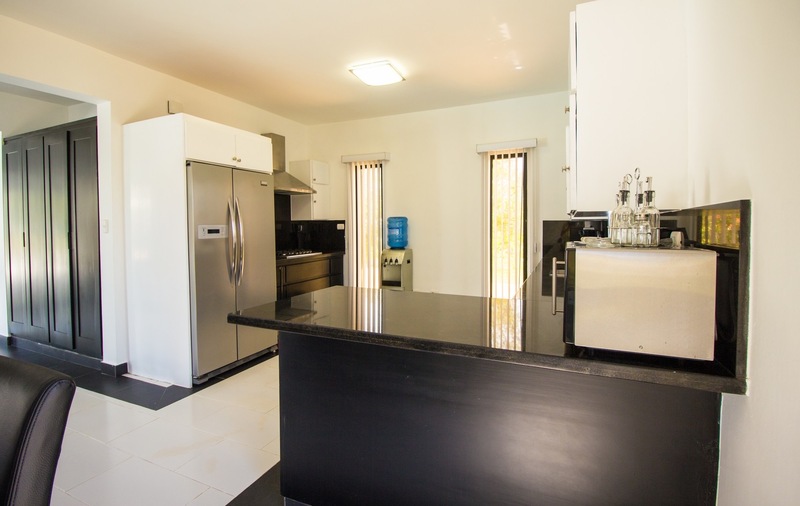 The Palappa on the other end has a bar and outdoor kitchen/BBQ area. 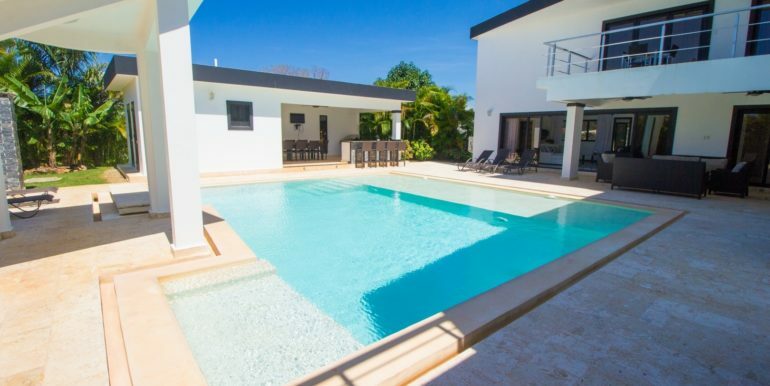 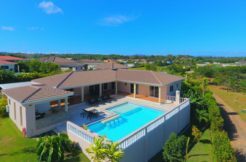 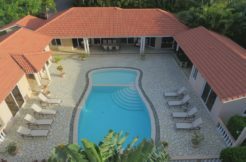 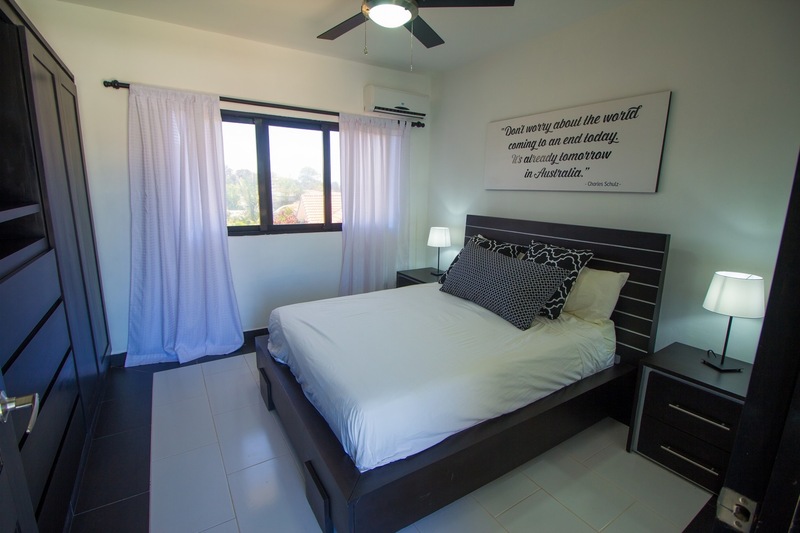 Vacationing in Sosua as a family or 4 couples in this villa rental feels like being in a classy, modern resort at a very private, personal level. 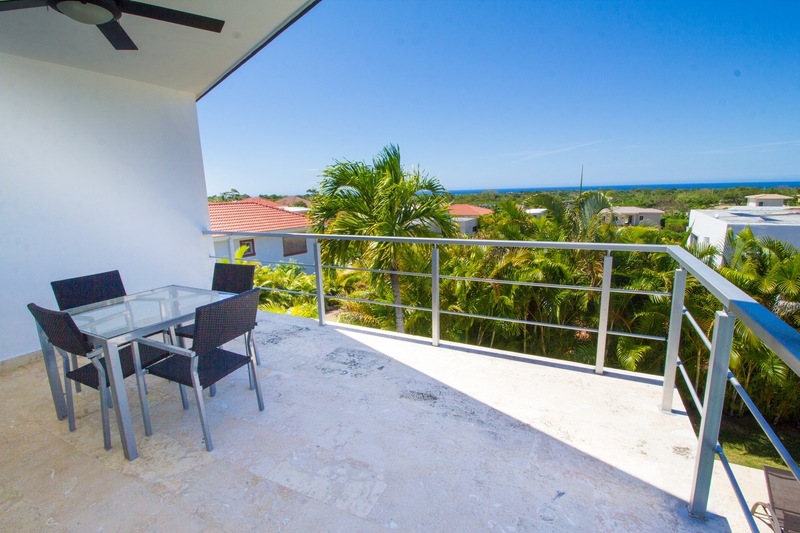 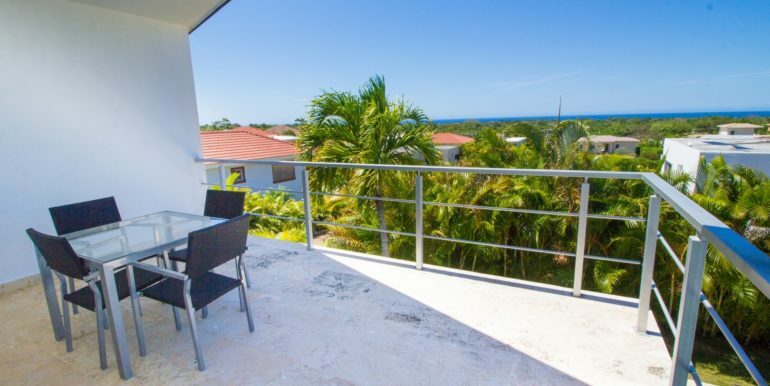 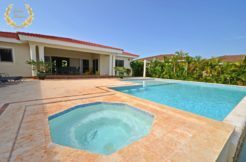 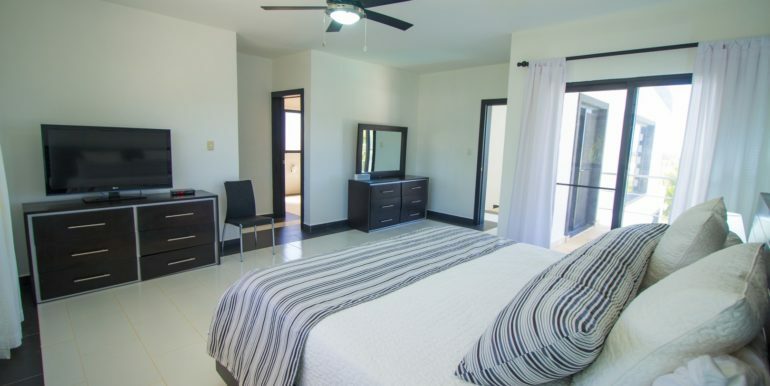 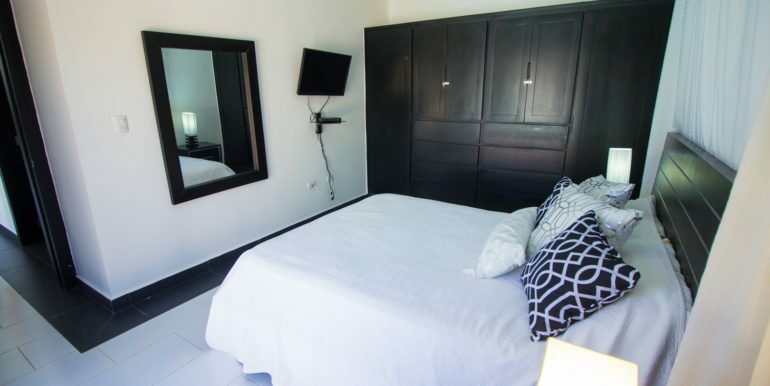 The community sits about 5 minutes driving distance to the main town center and Sosua Beach, same distance from Cabarete and about 10 minutes from the local POP airport on the way to Puerto Plata. 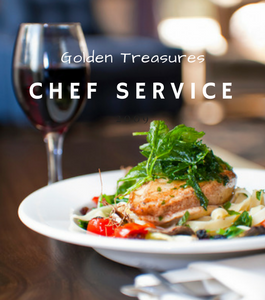 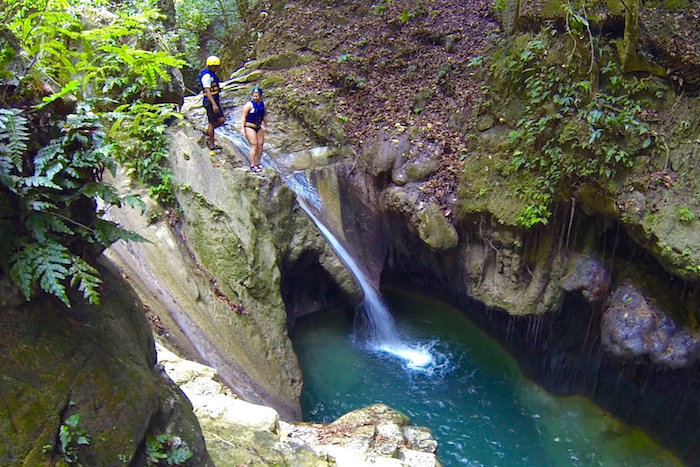 Sosua fishing tours, ATVs, yacht parties and more can be organized by the concierge. 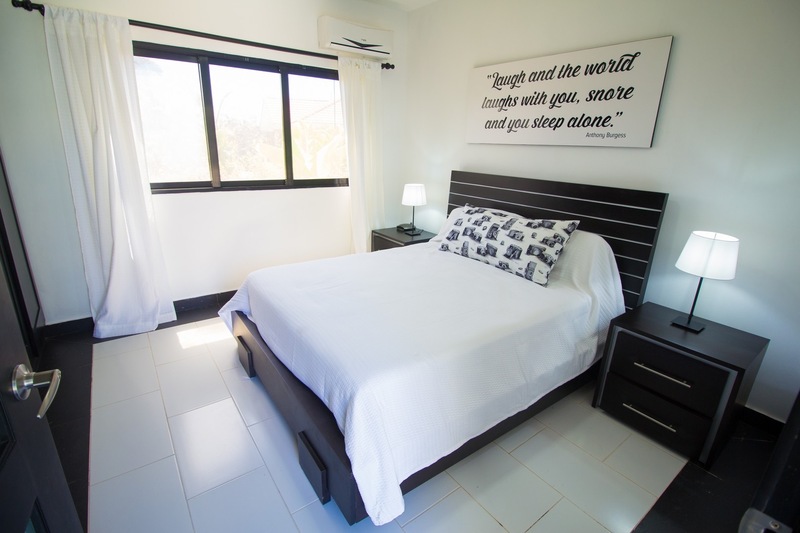 Please read the rental terms and service agreement attached to this listing, and contact us for more information and booking. 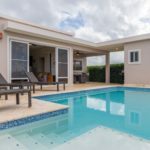 Ref# SPC1511-835.